Looking for a good read on mindfulness? 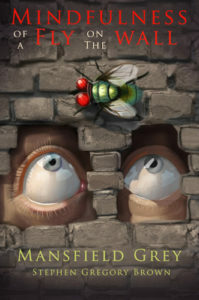 Check out “Mindfulness of a Fly on the Wall”. A portion from each book sold will be donated to our agency! Stephen Gregory Brown is the author of “Mindfulness of a Fly on the Wall”. His experiences have lead him to write about mindfulness exercises on how to conquer stress, live free and have a happy, healthy, fulfilled life through the alignment of mind, body and soul. Stephen is the father of 3 adopted children and 3 step-children. His book touches on the re-conditioning of his adopted 6, 8 and 10 year old and the blending of families for a cohesive, nurturing environment. Stephen’s goal is to have mindfulness taught to children in schools and have young adults realize, what the mind believes, the body will follow. The book is available on amazon.ca and locally at Pickwick Books in Waterdown and The Printed Word in Dundas.